Add the potatoes, green peas, turmeric powder, green chilli paste, coriander and salt, mix well and cook on a medium flame for another minute. Divide the aloo stuffing into 4 equal portions and keep aside. 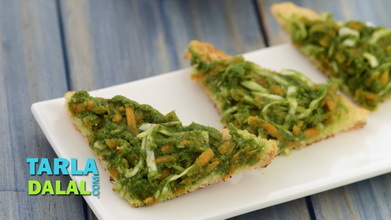 Apply 1 tsp of butter and 1 tsp of garlic green chutney on each bread slice and keep aside. 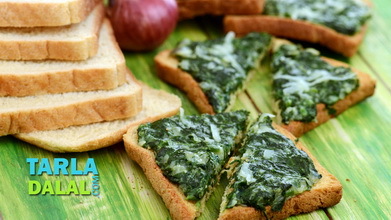 Place a slice of bread, with the buttered side facing upwards, on a clean, dry and flat surface. Place one portion of the aloo masala and spread it evenly over it. 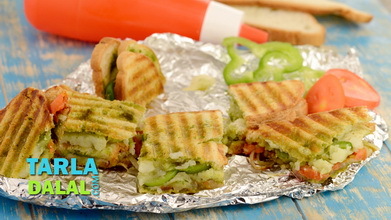 Arrange 2 onion slices, 3 tomato slices and 6 to 7 capsicum slices over the stuffing and sprinkle ¼ tsp of sandwich masala evenly over it. 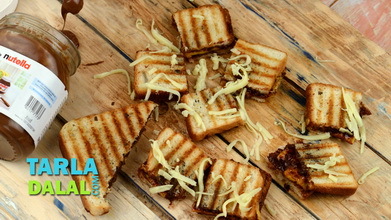 Cover it with another slice of bread, with the buttered side facing downwards and press it lightly. Spread ¼ tsp of butter evenly over the bread slice. 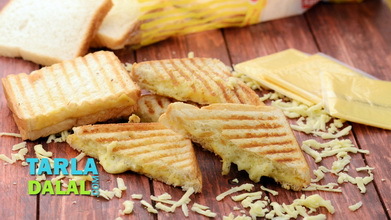 Grease a sandwich toaster on both the sides using ½ tsp of butter. 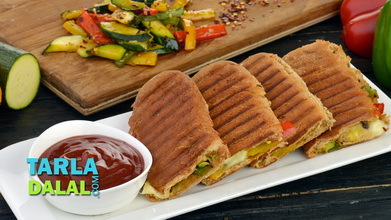 Place the sandwich in the sandwich toaster and cook on a medium flame, till it turns brown and crisp from both the sides. 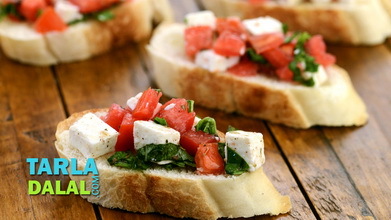 Cut into 6 equal pieces, place it on a plate and apply ½ tsp of butter evenly over it. Sprinkle 1 tbsp of sev evenly over it. Repeat steps 2 to 8 to make 3 more toasts. 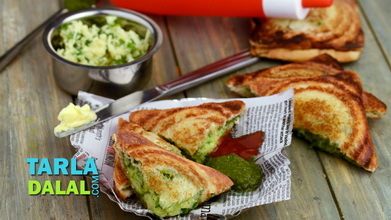 Serve immediately with tomato ketchup and garlic green chutney. 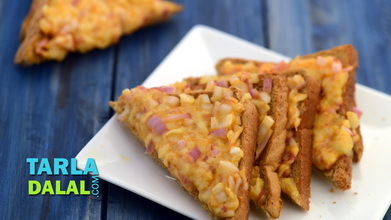 Cheese masala toast: place a generous amount of grated processed cheese over the capsicum slices (at step 4 after the capsicum slices) and proceed as per the recipe. Finally at step 8 replace the nylon sev with grated processed cheese for the topping and serve immediately.